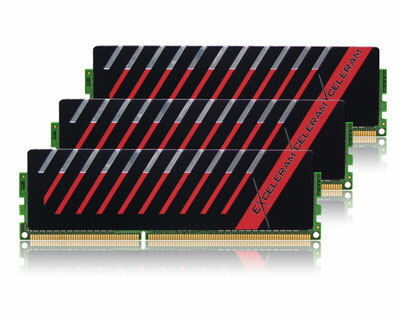 Exeleram, a high end memory manufacturer has just announced the availability of 3 new additions to their high end EP Series ram segment. The new series are available in Single,Dual and Tri-kit configurations. With a default speed of 1333Mhz, these monsters can go all the way upto 2214 Mhz at CL9 timings at 1.5 volts without any heat issues at all! All of these rams come with their famous Power Chip Rev. D 128 * 8 chips that help these high speed modules achieve such high targets! Landau, 21st February 2011: Exceleram – the Highend MemoryBlacksmith in Landau / Germany announces the availability of 3 new parts of the EP-Series, and expanded its product range. “The EP series includes memory(kits) based on timing latencies of (currently) 1333mhz, but with “air” up to the top, so that overclockers have their fun.” says Steffen Eisenstein, Product Manager at Exceleram. We start with 3 models: the EP3001A, a 2GB 1333MHz CL9 single module. Followed by a 4GB (2x 2GB) 1333MHz CL9 Memorykit and a 6GB (3x 2GB) 1333MHz CL9 kit, both with the known “Rippler” heatsink. The voltage is 1.5 volts and all are exclusively equipped with the famous Power Chip Rev. D 128 * 8 chips. What speeds are available, one can read the high score list on the Web site from Exceleram (http://www.exceleram.com/html/ep-serie.html). The currently peak is at 2214MHz. “We have no expense or effort spared to provide the review sites and printed magazines our new EP3001A in a large quantity. The only way we can provide the performance of the selected Exceleram chips for the first memory of the EP series demonstrate “added Steffen Eisenstein.